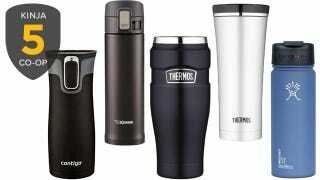 Our call for Best Travel Mug contenders was one of the biggest and most contested we’ve ever had. You’ve poured and sealed an awesome list of five nominees, and now it’s time to vote. The Contigo brand garnered huge numbers of votes, probably the most we’ve ever seen for a product in the preliminary round. Contigo detractors criticized the difficulty of cleaning the previous model’s lid, which has been fixed in the newest iteration. Available in 16oz and 20oz versions and in many colors. The Zojirushi brings with it an endless list of positive critical and consumer reviews. 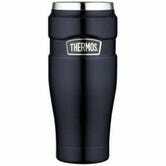 The latest version is an improvement, though The Sweethome notes (in the article where they declare the Zojirushi to be the best travel mug), that the newer model includes a non-stick fluorine coating that some may choose to avoid. 16oz. I bike to work and don’t have a drink carrying device on my bike. I have used lots of “leak proof” tumblers but this is the first that I can actually throw into a bag, shake it all around, and absolutely have zero leaking. It also keeps my coffee warm all day. One day I forgot to take it out of my bag until the mid-afternoon and my coffee was still steaming hot! All the parts of the vacuum seal come apart so it can be de-gunked. I put all the parts in the dishwasher and I never have had to deal with dank gross stenches coming out of lid-cravasses as I have with other kinds of travel mugs.